Now that Spring is here, it’s normal to start building, improving and changing all aspects of your house. We predicted that the design trends you’d see in 2013 would include beautiful garden and outdoor spaces. As the weather warms up, it’s the perfect time to create your dream garden! Other projects that will keep you in style are local design touches and green automation. Check out these great ideas from Realtor Magazine to get your spring projects in motion! (New Braunfels, TX) — The New Braunfels Masonic Lodge presented their Community Builder Award last night to Comal County Judge Sherman Krause (right). Thank you to everyone who participated in our Veteran Fishing Derby with Pro Angler Jimmy Houston. We had an amazing turnout and are so thankful to everyone who helped raise money for Sgt. Monte Bernardo's new home. 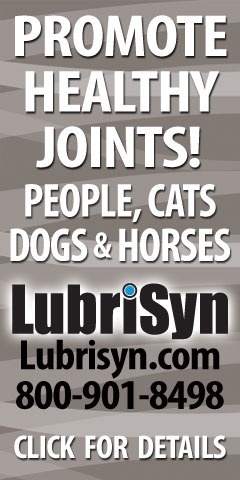 Check out the photos & fun below! Join us for an Easter Egg Hunt! 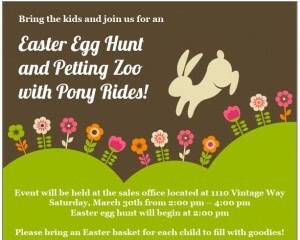 Bring the kids and join us for a residents’ Easter egg hunt & petting zoo with pony rides! Event will be held at the sales office located at 1110 Vintage Way on Saturday, March 30th from 2:00 pm – 4:00 pm. The Easter egg hunt will being at 2:00 pm. Please bring an Easter basket for each child to fill with goodies! 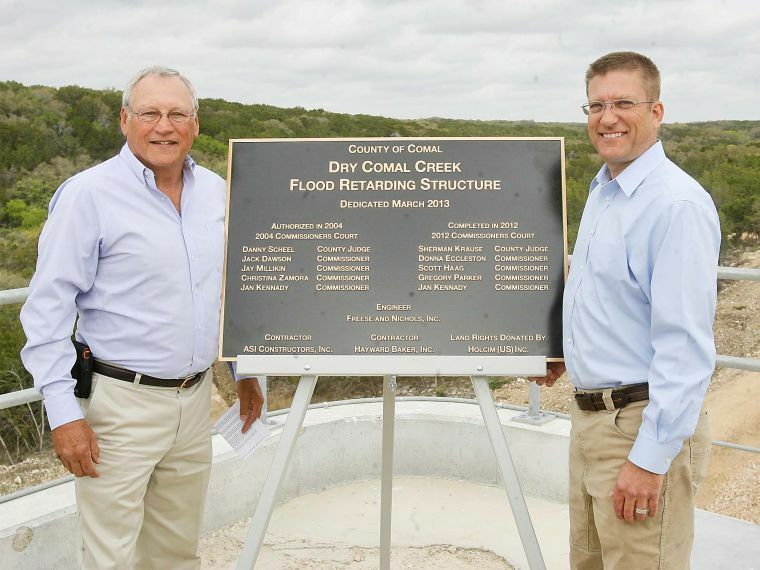 NEW BRAUNFELS — County officials, visiting dignitaries and a crowd estimated at 100 gathered atop the Dry Comal Creek Flood Retarding Structure on Thursday morning to officially dedicate the new county dam that will likely save lives in New Braunfels. 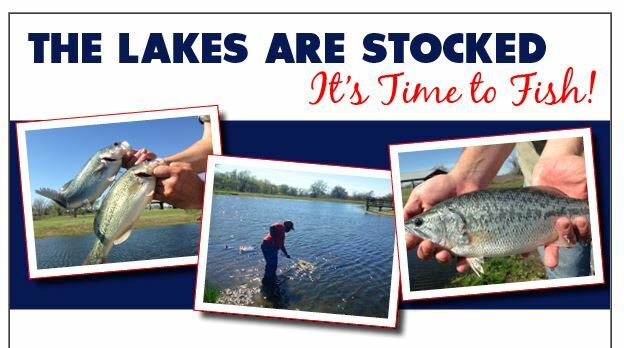 On Thursday, King Oaks stocked two of its community lakes in preparation for the Veteran Fishing Derby this Saturday, March 23. More than 150 pounds of fish were put in the lakes! From Bending Branch to Woodrose, Hill Country wineries are showing how good their bottlings really are. You voted for the best finger licking, lip smacking barbecue in town! 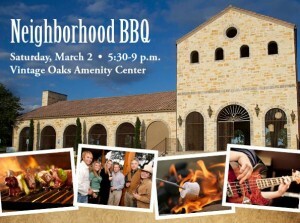 Don’t Forget the Vintage Oaks Community BBQ This Weekend! This Saturday from 5:30-9 p.m., bring your friends and family to the Vintage Oaks Amenity Center for an evening with the neighbors! Join us for a catered barbecue dinner, beer/wine and a S’mores bar — while basking in the warmth of our new fire pits. Live music will be provided by the Texas Twisters, featuring great hits in classic rock and country. So bring a lawn chair and your dancing shoes! 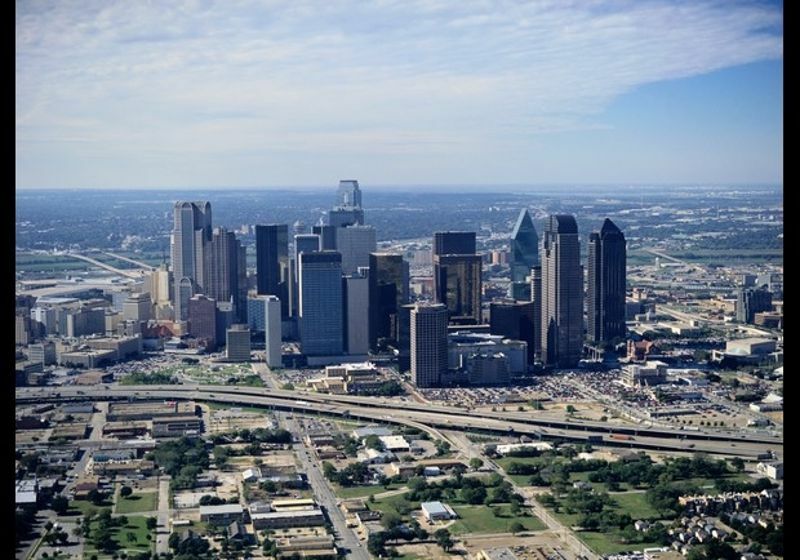 Texas trounced the rest of the country our latest survey of the Best Cities for Good Jobs, with five metropolitan areas in the Top Ten, including the four best cities to find jobs in the next few years. Vintage Oaks recently released 5 premium 1.5-acre cul de sac properties. Property tours have begun and we encourage you to make an appointment! 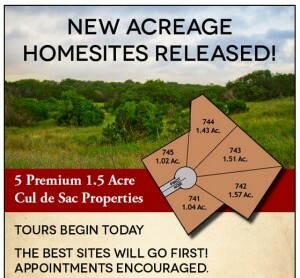 These new acreage homesites feature the best of the Texas Hill Country — beautiful trees, panoramic views and spacious properties ready for your custom dream home. This property release includes 5 premium 1.5-acre sites on a private cul de sac, as well as coveted sites in the new, gated Champagne Hills neighborhood. Schedule your appointment today at (877) 904.9112 or email us at info@southstarcommunities.com for more information. Vintage Oaks is a master-planned community located in the heart of the Texas Hill Country Wine Trail, just a short drive away from both San Antonio and Austin. The community provides several amenities including two pools, a lazy river, walking trails, an amenity center and more. Vintage Oaks is the perfect residential neighborhood to build your family’s dream custom home and enjoy all the best that New Braunfels and the Texas Hill Country have to offer. With so many wonderful things to do here, it is hard to narrow it to just ten. However, we’ve shared our favorites with you and invite you to come discover how you can live life to the fullest at Vintage Oaks. Compared to six months ago, nearly two times as many potential first-time homebuyers are optimistic about being able to put money down on a home over the next six months, according to JPMorgan Chase. Buying your first home is not something you (or anyone) should take lightly. You should be prepared with as much information about the process as you can learn before you begin. You should understand your real estate market and the current mortgage market. 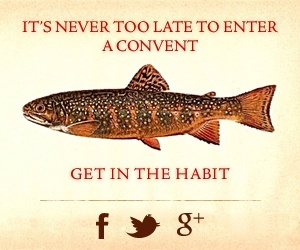 The more you know - the better. Make sure to register early for the King Oaks Veteran Fishing Derby with professional angler Jimmy Houston. Join us Saturday, March 23 from 10 a.m. – 4 p.m. and bring the family for food, fun and fishing at the King Oaks community lakes. The Texas Twisters will be playing, there will be a bounce house for the kids and door prizes provided by Aggieland Outfitters. Register online at www.AggielandVeteran.com for $10 per person (children 6 and under free). All monies help build our Aggieland Veteran’s Home! Because flowers aren't all that's sure to pop up once the snow melts.